In a packed room at the Manhattan auction house, a 1920s mandolin-banjo with a presale estimate of $300 to $500 sold for $3,200. A gold sales award for the album “Me and Mr. Johnson,” estimated at $600 to $900, fetched $32,000. A 2008 Martin acoustic guitar on which Clapton played the song “Motherless Child” sold for $58,000, well over its presale estimate of $3,000 to $5,000. All sale prices are before buyer’s commission. Wednesday afternoon, a selection of amps, guitars and other memorabilia from rock star Eric Clapton’s personal collection were auctioned off at Bonhams in Manhattan to a room chock-full of fans of the English rock icon. Guitars and amps, which had starting prices that ranged from $300 to $30,000, sold for more than the auction house expected. The most surprising sale early on was a 1979 three-quarter size acoustic guitar made by Danny Ferrington, which went for an astounding $42,700, 100 times more than the expected price tag, according to the London-based firm Wallace & Hodgson who organized the auction with Bonhams. Many of the guitars up for auction are only two to three years old, like the 2005 custom-built black Fender Stratocaster that Clapton played during his Cream-reunion concerts. This was the first time Clapton offered up his vintage amplifier collection for sale, which included a mid-1960s Supro S6698 ‘Sportsman,’ the same model used by Jimmy Page on the Led Zeppelin II album. The amp sold for $28,060. This is the third time that Clapton has auctioned off part of his musical collection to the public. 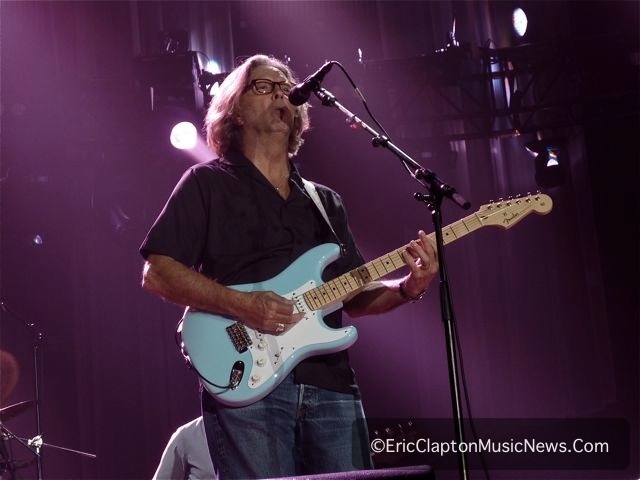 Proceeds of the sale aimed to support the Crossroads Center, a drug and alcohol center founded by Clapton in Antigua.